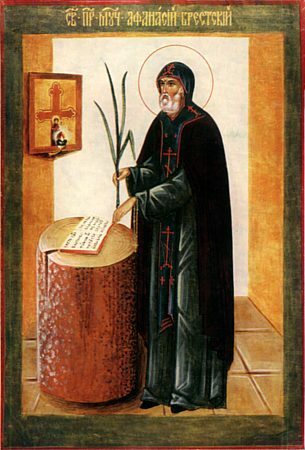 The MonkMartyr Athansii (Afanasii) of Bretsk was Belorussian and was born in about the year 1597 into a pious Christian family named Philippovich. He received a serious upbringing, and he knew the theological and historical literature, as is evidenced in the diary of the saint, which has been preserved. In his youthful years Saint Athanasii for a certain while was a teacher in the houses of Polish merchants. In the year 1627 he accepted tonsure under hegumen Joseph at the Vilensk monastery of the Holy Spirit. The Monk Athanasii was ordained priest-monk in the year 1632 and made head of the Duboisk (Dubovsk) monastery near Pinsk. Saint Athanasii, with a special blessing of the Mother of God, self-denyingly re-established Orthodoxy within the boundaries of the ancient Russian territories that had been seized by the Polish Reche. Between the years 1638-1648 Saint Athanasii fulfilled his obedience as hegumen of the Bretsk Simeonov monastery. The monk endured much abuse from the Uniates and illegal persecution from the civil authorities – he thrice suffered being locked up in prison. The saint was sent off to the authorities at Kiev to appear before a religious tribunal, but he was acquitted, and returned again to his own monastery. Over the course of ten years the Monk Athanasii, finding himself amidst persons maliciously disposed towards him, led a constant struggle for Holy Orthodoxy, – his faithfulness to which is evidenced by his sufferings. Attempts to wear down the spiritual endurance of the saint were to no avail. He again went to trial, by the decision of which, for his cursing of the Unia, the monk was sentenced to death by execution. Saint Athanasii died a martyr on the night of 4‑5 September 1648 (the Uncovering of Relics was on 20 July 1679).